Blackjack evolved from similar card games around the 17th century. From time to time casinos kept on tweaking the rules in order make blackjack attractive enough for players to wager but at the same time remain viable for the casinos. The last decades of the twentieth century saw a conflict between expert blackjack players and land casinos in Las Vegas and Atlantic City over the issue of card counting. In online casinos blackjack games use new full decks after every deal so card counting is not possible. However online blackjack allows the use of strategy cards so that even novice players can make optimum moves. In blackjack each card is assigned a value. The cards from twos to tens are given their face values. The picture cards have a value of 10. The ace can take a value of 1 or of 11, depending on the situation. The value of the hand is the total of the values of the cards. In blackjack the player tries to get a hand value closer to 21 than the dealer, but without exceeding 21. After the player places his wager he is dealt two cards and the dealer is dealt one card face up and one card face down. If the dealer’s face up card is a 10 value card he checks the face down card for blackjack. Blackjack is a special hand consisting of a 10 value card and an ace. It is a natural winner. If the dealer has a blackjack he wins. If not then the player has to make his moves. The following options are available to the player. The player can Stand and not take any more cards. The player can Hit and take another card. In the process if his hand value crosses 21 then he busts and loses. 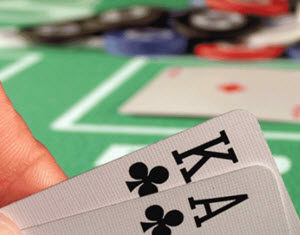 If the player stands then the dealer’s hand is played according to prescribed rules. If the dealer busts than the player wins. If the dealer also stands then the hand values are compared and whosoever has the higher hand value wins. A normal player win is paid even money. A player win with a blackjack is paid 3 to 2. If the hand values are equal the bet pushes. There are some special moves for the player. These are Split, Double and Insure. These moves can be only under specified conditions. Some online casinos allow a player to Surrender, in which case he loses half his wager. Blackjack strategy is outlined in a strategy card, which is in the form of a matrix. It is based on computer simulation of tens of thousands of deals. The strategy describes all possible situations the player can find himself in and outlines what he must do in those situations. The strategy depends on the player’s current hand value and on the dealer’s face up card. The value of the dealer’s face up card is described in the columns and the player’s current hand value is described in the rows. The rows also address certain special situations like the player’s dealt cards being a pair. Each cell in the matrix therefore corresponds to a given situation the player may find himself in. The cell describes what the player must do. It contains one of the following options – Hit, Stand, Double, Split, Insure or Surrender. There are several online blackjack variants that differ in the exact rules and the number of decks employed. The strategy card is different in each case. Therefore some of the software providers to online casinos incorporate the strategy card in the game. They allow players to set up the game in auto play using the strategy card. This ensures that the players will not make any mistakes. There are lots of Blackjack tips surrounding the game, as hitting, standing, or splitting certain hands can give you a great chance of winning. There is a tip or strategy for every possible card combination in Blackjack, but here we will group many of them together and only point out the most important few. A “soft” hand is one where there is an Ace. This is because an Ace can go either way, as a 1 or 11. A “hard” hand is where there is not one. Always hit on a hand of 16 or less because there is little to no chance you will bust and the dealer will always have a better hand if you don’t. Hard 17 is more complicated and your decision should be based on the casino dealer’s showing card. Hit if the dealer has 8, 9, 10, J, Q, K, or A. Otherwise stand and cross your fingers that the dealer will bust. Soft 18 is also complicated and should be based on the casino dealer’s showing card. If the dealer has 9, 10, J, Q, K, or A then you should hit, otherwise it would be best to stand. Always stand on 19 and 20. Blackjack is one casino game, such as Poker, when a solid strategy may actually give you a greater chance of winning. Your only opponent is bad judgment. Hopefully these tips and strategies will help you win the next time you are gambling on the game of Blackjack.